On popular demand, the paper submission DEADLINE has been EXTENDED till February 7, 2016, 23:59 Pacific Standard Time. 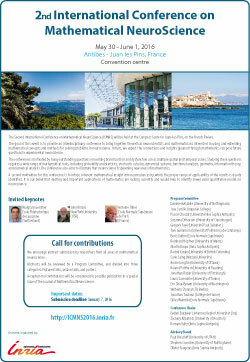 We encourage abstract submission by researchers from all areas of mathematical neuroscience. Please share this information with your students and postdocs! This year abstracts will be reviewed by a Program Committee, and divided into three categories: featured talks, session talks, and posters. Featured talks will be delivered to all attendees, while session talks will be given in parallel afternoon sessions.